When older people develop atrial fibrillation — the most common type of irregular heartbeat – the condition accelerates age-related declines in walking speed, strength, balance, and other aspects of physical performance. That is the finding of research published in April 2016 in Circulation: Arrhythmia and Electrophysiology, an American Heart Association journal. 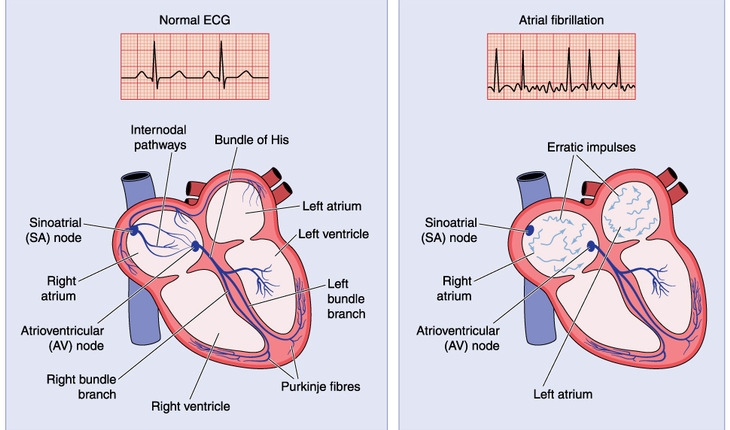 The release explains that In atrial fibrillation, the heart’s two small upper chambers (atria) beat irregularly and too fast, which may increase the risk of stroke, heart failure and other conditions. The risk rises with age. The researchers examined physical performance at ages 70, 74, 78, and 82 in 2,753participants (52 percent women, 41 percent African American) in the Health, Aging, and Body Composition (Health ABC) study, a long-term investigation of aging-related health outcomes in Medicare recipients. At the beginning of the study, all of the participants were able to live independently. participants diagnosed with AFib declined more swiftly on each individual element of the test. “Small declines in physical performance in older adults may have big consequences. The declines that we observed in participants with AFib are associated with increased frailty, which can result in loss of independence, decreased mobility, poorer quality of life, institutionalization and death,” Magnani said. Because the study enrolled only adults living independently, the results may not apply to older adults with greater cognitive or physical limitations. In addition, these results do not prove a direct cause-and-effect link between AFib and declining physical performance. “There may be other factors, such as inflammation or accelerated muscle loss, that contribute to both increased risk of AFib and declining physical performance,” Magnani said. Co-authors are Na Wang, M.A. ; Emelia J. Benjamin, M.D., Sc.M. ; Melissa E. Garcia, M.P.H. ; Douglas C. Bauer, M.D., Javed Butler, M.D. ; Patrick T. Ellinor, M.D., Ph.D.; Stephen Kritchevsky, Ph.D.; Gregory M. Marcus, M.D., M.A.S. ; Anne Newman, M.D., M.P.H. ; Caroline L. Phillips, M.S. ; Hiroyuki Sasai, Ph.D.; Suzanne Satterfield, M.D. ; Lisa M. Sullivan, Ph.D.; Tamara B. Harris, M.D., Ph.D.